Instructions: Card size is 6 x 6". Using Tweet Cherry Blossoms stamps, stamp 1 of each size using the Rouge ink, this is pigment ink so let it dry before cutting with the coordinating die. 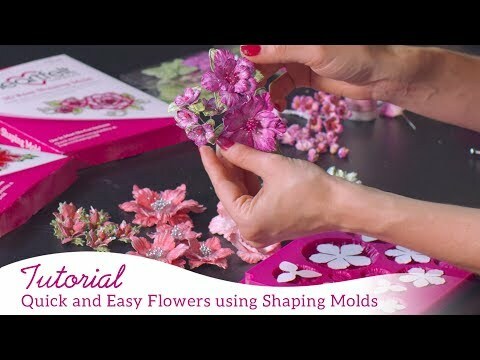 Spray lightly with mister and shape in your 3D Cherry Blossom shaping mold. Using the Cherry Blossom Retreat stamps, stamp 1 of each leaf spray using the Bamboo Leaves ink. Color with the same ink. Cut with coordinating dies. Highlight the edges a little darker with the same ink. Shape with the Deluxe Shaping Tool Kit. Using the Cherry Blossom Retreat stamps, stamp the sentiment banner, color lightly with the Antique Linen ink and cut with coordinating die. Cut white cardstock 12" x 6". Score on the 3" mark on the left and right-hand sides to create a gate fold card. Using white cardstock cut decorative diamond and lace mat. Using the Cherry Blossom Retreat Paper Pad, cut front wishing well and mat using a Cut Mat Create Die. Using 3d dots adhere together. Trim the borders from the cardstock until you are left with the two square front panels, trim down further to measure 5 3/4" wide, turn over so you are using the check side. Trim a mat 2 3/4" from the left and repeat from the right. Cut 1 mat from the center 5 3/4" x 5 3/4". Card assembly - Adhere your insert mat. Adhere your front left and right mats so that the curved flowers are to the top. Using 3d dots adhere your Diamond & Lace mat to the left-hand side of your card front only. Line it up so it sits in the center of your card when closed. Adhere one leaf spray to the left and one to the right of your main front mat intertwining below and above the lace mat and adhere in place with a little glue in a few areas so as to hold firmly in place. Using 3d dots adhere your sentiment. Add a dot of glue at the top of the chain to hold in place. Adhere you flowers as desired or as pictured. Decorate with stickles or glitter of choice.